Imitation or innovation: can China be a real force in tech? Is China about to flourish as an innovation superpower? Do you own a Chinese-made gadget? You almost certainly do; virtually all smartphones and tablets – and much more besides – are manufactured in China. The home of Foxconn and a whopping 162 of the world's top 500 companies, Shenzhen in the country's Pearl River delta is where most electronics originate, from smartphones and tablets to laptops, TVs, displays, scanners, portable batteries, printers, projectors, LED bulbs, digital cameras, Bluetooth speakers, DVD/Blu-ray players, home appliances and even e-cigarettes. China makes it all. But can you name a Chinese electronics brand? The biggest global brands are largely from just three countries; Japan (Sony, Panasonic, Canon), South Korea (Samsung and LG) and the USA (Apple and Microsoft), all of whom use China to get their products made. China is full of expertise, not just in manufacturing products but in designing them, too – almost every stage of manufacturing is now outsourced to The Red Dragon. They make everything for everyone else, so why don't Chinese companies step out of the shadows and take the tech world by storm? There are successful Chinese electronics brands that all of us have heard of. Really only one – Lenovo – is familiar to us all. Lenovo bought IBM's laptop business and now owns Motorola's smartphone business. The others are best described as 'emerging' – the likes of Huawei, ZTE and Xiaomi, which wants to be known internationally as Mi – are all beginning to issue consumer devices globally, or at least threatening to. Other names you may have heard in the tech press include internet firms such as search engine Baidu, Tencent and Alibaba. "Chinese tech giants like Huawei and ZTE have been listed since 2007 amongst the top 10 companies worldwide in terms of PCT applications," says Simone Corsi at Lancaster University Management School, which runs the China Catalyst Programme to pair SMEs from the UK and China on R&D projects. "Huawei topped that ranking in 2008 and ZTE and Huawei were respectively second and third in 2013, before US companies Qualcomm and Intel, and just after Panasonic." Emerging they might be, but all of those Chinese brands – and many more like them – are already massive at home. Take the display market. 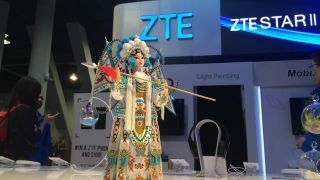 "The Chinese domestic TV market is 20% of the global market," says Jack Wetherill, Senior Market Analyst at FutureSource, "which gives brands such as TCL, Hisense and Skyworth economies of scale that they can leverage internationally … as domestic Chinese brands face a highly competitive local market they continue their push into other territories, and generally lead on price." Hisense – the biggest TV brand in China – has become one of the fastest-growing electronics brands in Australia and the US, too, where it sponsors the Australian Open Grand Slam tennis and NASCAR Xfinity, respectively. It's a fast-changing market – Chinese brands have grown their share of the global TV market from just 12% in 2011. China produces 2.5 billion phones each year, over half the global output. Often called 'the Apple of China', Xiaomi is China's biggest smartphone seller in just its fourth year. Its latest product, the Mi Note, is almost identical to an iPhone 6 Plus, though slightly larger and lighter, but it costs a fraction of the price. Beyond Xiaomi there are dozens of other Chinese smartphone brands ready to pounce. As the world's largest telecoms equipment maker, Huawei is using its global leverage to push its Honor brand of smartphones in the USA and Europe, while another Chinese brand, ZTE, which sponsors the New York Knicks basketball team, aims to ship 60 million of its Nubia and Star 2 smartphones globally in 2015. A brand new smartphone company called OnePlus is currently building an army of 'brand evangelists' across the globe while the likes of Oppo, Gionee, IUNI, Coolpad and Meizu are growing fast, too. Phones have always been made in China, but until recently the country's electronics brands have lacked the desire and the marketing know-how to hit foreign markets. Xiaomi only sells its phones online, in limited quantities and in timed sales, under the motto 'just for fans'. Last year, Xiaomi's Redmi 1S smartphone sold exclusively on the Flipkart website in India sold out in a mere four seconds. "The way they are marketed is simply revolutionary," says Li Ma, International Business Director for Honey LLP, a social creative agency that helps Chinese brands enter foreign markets. "In marketing terms, China now leads the way in innovation." Xiaomi's decision to only sell online is unusual, but proving effective, and it's setting the tone for the brand's planned entry into emerging markets. "It saves Xiaomi from the high cost of partnerships with distributors, retailers, and network operators, but more importantly, this unconventional approach gives Xiaomi better control over the timing of market entry," says Ma.